This entry was posted in Community Events on November 14, 2018 . Holiday gift for the theater lover. 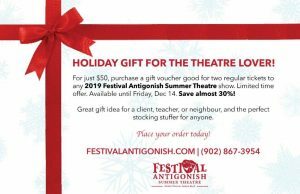 For just $50, purchase a gift voucher for two regular tickets to any 2019 Festival Antigonish Summer Theatre show. Limited time offer. Available til Friday December 14th. 902-867-3954.